Lily doesn't stop once she comes home from school. Often she wants to crack on with her work book - letters, sums and drawings or get stuck into an activity, usually with a snack and a drink. On Tuesday afternoon she goes to Film Club and is pretty tired once she has had tea so Tuesday feels like our lazy afternoon. 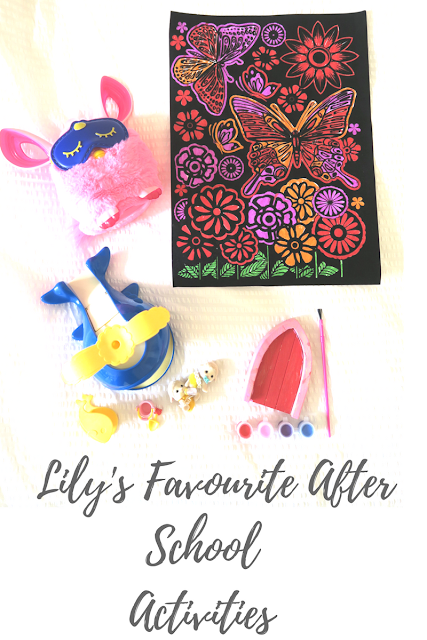 What has Lily been particularly enjoying lately? This has been great fun for her after school, especially to help cheer her up after a nasty cold she has recently recovered from. It will be completed when the weather is drier as she is intent on setting it up beside our garden pond which will be far more entertaining for any visiting fairies. With black felt design, colouring outside the lines is invisible. Lily received this as part of her early Christmas present from Father Christmas following Christmas at Marwell Zoo and she has been so chuffed with it, I will have to find more! These toys are great for Lily's imaginative play. Lily will become a big sister again next month so she has been enjoying playing with the baby twin sheep complete with their own bottle and dummy. We try to keep these toys away from Alexander who has generally muckier hands. Although both enjoy playing with the Splash and Play Whale in which other characters can play on the slide and with the teeny bucket and spade. Both kids have been enthralled with "Urby". Lily prefers playing and interacting with the pink fluffy toy itself whereas Alexander favours the app and hatching Furby eggs - although he did find out he could make the Furby need a poo apparently! Luckily for us grown ups the Furby has a sleep mask to pop on to stop any further Furblish babbling! Lily has really got into watching 'The Lily and Alex Show' - AKA our own YouTube channel. She adores watching Day in the Life and Weekly vlogs from the past, whether it be footage from when she was a baby or a toddler or when Alexander arrived. I definitely enjoy watching these memories with her too, and I am glad that I have captured our family life on camera.